Cindy Davis-Huffman has endured more than moments of fatigue. She nursed for 23 years in intensive care, among the high-stress, high-stakes environment of patients perched on death’s door. Between the ICU and her most recent second job as an organ donor nurse, she felt depleted, like a slow-leaking rubber life raft. With one child in grade school and the other in high school, the 44-year-old worked up to 50 hours per week in ICU and spent another 48 hours on call for her second job. Davis-Huffman says she would, on rare occasions, sleep all day. Her schedule seldom permitted a doctor visit — or cooking. She relied on fast food. Cindy’s fi ve-foot, 10-inch frame carried 425 pounds. Gastric bypass surgery allowed her to shed 180 pounds and whittle her take-out budget. You may know someone like Cindy. Or maybe you’re caught on fatigue’s molasses-coated treadmill. Surveys have shown women are three times more likely than men to report fatigue. Why are we so tired? And how do we fi x it? 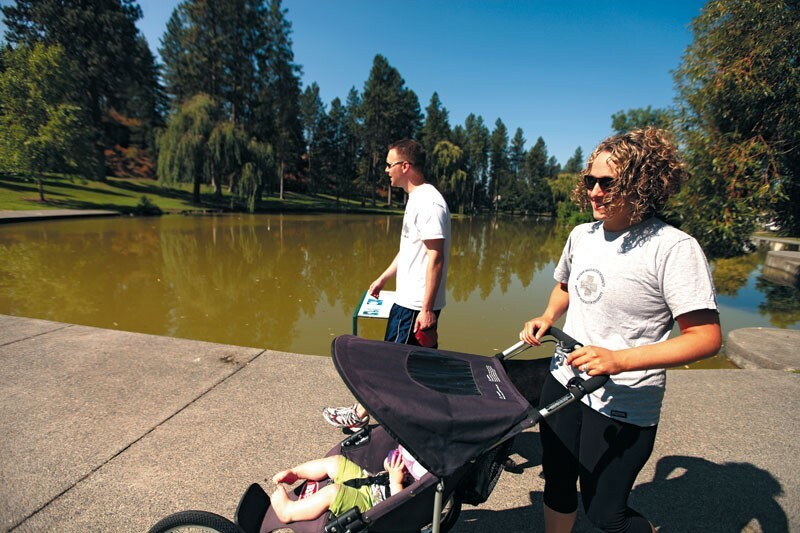 Dr. Monica Blykowski-May, a family doctor at Rockwood Northpointe in Spokane, estimates 70 percent of women over age 30 complain of fatigue. She says most “textbook” diseases share fatigue as a symptom, making it tough to pinpoint a specifi c cause. She recommends a medical evaluation if you notice a signifi cant change in what you used to be able to do lasting more than a couple weeks: If you’re suddenly short of breath when exercising; if you’ve lost 10 pounds without trying. Though actual chronic fatigue syndrome is rare, Blykowski-May says some fatigue-inducing conditions are fairly common — low thyroid hormone levels, diabetes and vitamin D defi ciency — and can be discovered through lab tests and managed with diet, exercise, medication and vitamins. Anemia, a condition in which there are not enough healthy red blood cells to provide oxygen to the body, also causes fatigue. Often it is related to iron-defi ciency. Recent studies have shown one in five women to be anemic; half of pregnant women also have low stores of iron. Anemia can also be caused by other nutritional deficiencies or poor absorption of nutrients, or by diseases affecting the production and maintenance of red blood cells. What if your lab work seems just fi ne? Sometimes fatigue is the result of a sleep problem, which can be diagnosed in a sleep study, but it may simply be a result of not getting enough sleep. Sometimes even when exhausted women make time to sleep, it can be elusive. Ethington says overstimulation is one of our greatest stressors. We stare at screens — computers, cell phones, TV — seven days a week. We never unplug. When’s the last time you just stared up at the clouds? Switched off your mental to-do list? Ethington calls medication a last resort when someone can’t function and they’ve already tried other stress relievers. She suggests devising ways to manage stressors. That’s key for women spinning at the center of life’s carousel. We work, nurture children and aging parents, tend homes and communities. Like Marge Simpson of cartoon fame, we scrub one last dish before fleeing a burning house. Ethington advises moving your body long before the figurative fire fries your brain. “One of best things is exercise,” says Ethington. “That’s counterintuitive: ‘If I’m so tired, how do I get the energy to walk around the block?’” But she says the effort will pay off. Be patient. Ethington says it takes weeks or months to make new habits stick, so don’t give up if you fail to see results after a week of unplugging early and going to bed. Diet makes a difference, too. Leslie Hebert, a 30- year-old marketing director with Gonzaga University, says changing her diet has changed her life. Hebert’s energy level had been fl agging for years. She sought answers after tests at her doctor’s offi ce proved inconclusive. Hebert learned she had a soy allergy, then found out nearly everything she was eating contained soy by-products (used as a thickener), like salad dressing, chocolate, chewing gum and tea. The married mom of a 14-month-old says she was able to work, fi nish graduate school and have her daughter all at once, thanks to banning soy four years ago. In spite of the almost overwhelming urge to grab a candy bar to boost energy, Giesa says sugar in general promotes lethargy. Instead, try eating complex carbohydrates like whole grains, legumes, fruits and vegetables to feel energized. “They have nutrients that fuel our muscles and our brain,” she says. But she notes chronic, overwhelming fatigue may also arise from a medical condition: high blood sugar in diabetics causes fatigue, as does gluten for people with Celiac disease. For some, fatigue is just a fact of life. Sixty-threeyear- old Carol Schmauder has multiple medical conditions, including Parkinson’s, an autoimmune disorder called Behcets Syndrome (pronounced buh-SHETS) and fi bromyalgia. She also has a heart condition. While she limits sugar and manages her illnesses with immunosuppressive drugs, Prednisone and doses of compassion from her husband and friends, she says fatigue is hard for others to understand. What works for Cindy Davis-Huffman is working less: After 23 years holding two nursing positions, she quit her second job and left intensive care. She now works at Sacred Heart Medical Center as a clinical documentation specialist. It’s a 40-hour-per-week gig. (“No more, no less,” she says of her new job.) Davis-Huffman can help her kids with homework, attend soccer games and prepare meals. She says extra money would be nice, but she won’t trade cash for quality of life. THYROID DYSFUNCTION: Levels of thyroid hormone that are too high or too low can cause fatigue. SLEEP: Sleep apnea and other conditions may mean you are not sleeping as well as you think you are; a sleep study can diagnose these conditions. ANEMIA: Too few healthy red blood cells mean your body isn’t getting enough oxygen. ASTHMA: Impaired lung function can impair sleep and cause tiredness. MENTAL HEALTH AND LIFESTYLE STRESS: Depression and anxiety can cause fatigue.